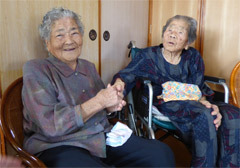 On September 7 at Nahe Shuri's house in Uruma City, Nahe Shuri (Right) and Toyo Agarie enjoyed the conversation with their family members. Three sisters, 106-year-old Nahe Shuri from Uruma City, 98-year-old Chiyo Moriya from Naha City, and 96-year-old Toyo Agarie from Yonashiro City will next month celebrate Kajimaya, an event that takes place in Okinawa when a person reaches their 97th birthday on the Lunar Calendar. The total age of the long-living sisters will be 300 years. In September, the thirty-third anniversary of the death of Shuri’s mother-in-law was held at Shuri’s house in Miyagi Island, Uruma City. Moriya could not attend because of a leg injury, but Agarie went and greeted Nahe. Family members and neighbors celebrated the longevity of a more than a century long life. Both Agarie and Shuri made their livings and raised their children in agriculture. Although Shuri has hearing difficulties, she is responsive in conversation. “I am happy to see everyone,” she smiled. Agarie told the people at the gathering that doing exercise and eating vegetables are her secrets of longevity. Seiyu Moriya, the first son of Chiyo Moriya said, “Although Chiyo could not attend because of her leg problem, she is still smart and has a big mouth. I hope the three sisters stay healthy and live longer. They are treasures of Okinawa.” The three sisters will gather at Agarie’s Kajimaya celebration, which will be held on October 18.